‘Thick Data’ for Marketers: It’s not just ‘Big Data’ that counts! In today’s business world data is the holy grail which is capable of opening many locks to consumers purchasing mystery. Whether it is streaming, operational or legacy data, it is growing at an exponential rate every day. Such massive amount of data is definitely transforming the ways in which businesses are being conducted. While, it is definitely positive to have better insight on the customers, such large amounts of data brings its own challenges and companies who will survive such challenges will live to tell the story and other which fails will lost forever t their competitors. There are lots of buzzwords in the tech industry which are buzzing around and ‘Big Data’ is the most famous among all of them and this refers to all the unstructured data which companies and businesses are producing. No matter which industry you are from, you company is most probably producing the Big Data in some way and in some form. Despite its name Big Data, it isn’t only the term which represents the information aggregation. Mainframe data is another terms which companies probably see on regular basis and those in finance industry are more likely to see it more than the other. From the beginning analytics have been important part of the marketing and before the explosion of the digital age managing analytics was very cumbersome but its importance was no less than it is today. It is with the help of big data analytics that companies were able to found out that which of their campaigns and products were most famous among the customers. Now with the help of internet the person can sell the stuff directly from its own website and can leverage all kinds of tools to figure out about his success or failure in the market and what matters among the customers the most. Analytics are great and many people in the world of business understand its importance but what really matters is how one can find a way to harness those analytics effectively for the success of the business. We no longer are dealing with single kind of data or information and all this different types of data needs to be aligned closer to the analytics which includes merging the non-relational data with the relational data. In the past this includes moving the data physically and this approach today is no longer valid and feasible practically. Providing analytics and doing it quickly is helpful and important. But, in doing so the demand for convenience must not be sacrificed. But, just because people are demanding this it doesn’t mean that they are going to get it. The challenge in analytics lies in converting and integrating all the data into the same format before it can appear on the customer and business kind of things. There is a solution available and it starts by ensuring that the software is indiscriminate when it comes to data sources. As long as this condition can be met, BI and analytic tools can effectively be used to pull the information which you need. It is not happening currently because currently they are using ELT (Extract, Load and Transform) method which is no longer effective because there is lot of data to harvest. It means doing some serious digging into legacy modernization process, mainframe data analytics is the best way to get the best possible analytics for the company’s data. Virtualization of the mainframe data is the key factor which will make all the difference which means having specialized processors to operate with the mainframes central processors. With this your company will be able to expand the operations by accessing all the data which is being generated constantly. 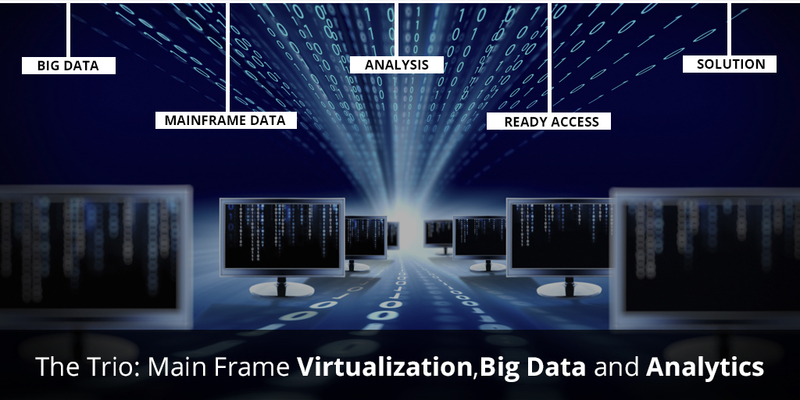 Mainframe data virtualization is the future of the analytics and with this it is possible for your business to do more than ever before. Big Data Analytics & Predictions; How Will Companies Utilize these Platforms in the Year 2017? How Can Businesses Utilize Big Data to Perform Better than Competitors?